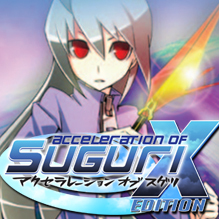 Acceleration of SUGURI X-Edition on PlayStation 3 was delisted no later than August 8th, 2015 in the US and is one of many delisted titles from the studio formerly known as Sony Online Entertainment. The game was available on the European PlayStation Store but was delisted between August 2016 and July 2017. The game was also available through Desura but the service was purchased in October of 2016 and is currently offline.